Brothers Monte and Ray leave Oxford to join the Royal Flying Corps. Ray loves Helen; Helen enjoys an affair with Monte; before they leave on their mission over Germany they find her in still another man's arms. An ego-driven, aspiring physician, intolerant of the weaknesses of others, especially those closest to him, comes to grips with his own imperfections. A sheriff tries to stop homesteader conflicts in the West after the Civil War. Pat Garrett: I don't blame you, but I ain't gonna make no trouble for Doc Holliday. He's my best friend! And run for the hills is exactly what Howard Hawks did after Howard Hughes couldn't keep his hands off the production. Mr. Hughes or someone took over direction and gave us the finished product which is a mess but a lot of fun just the same. 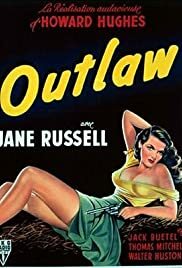 The build-up of Jane Russell (no pun intended) was one of the great publicity moves in film history. That famous shot of her lolling around on a bale of hay with her famous chest falling about was enough to entice most red-blooded males to this film And she didn't disappoint as Rio, the girlfriend of many, faithful to none. Throw in Pat Garrett, Billy the Kid and Doc Holliday (where did he come from?) and you've got a mix of relationships that vies with "Brokeback Mountain" for male bonding. And just for the hell of it, add some Indians which cause our heroes to embark in a cloud of dust across the landscape. I found Jack Buetel (or Beutel) a rather attractive actor in a wispy kind of way. Jane Russell's chest probably weighed more than he did. Unfortunately he never recovered from this film outing and sank into oblivion This film is about as coherent as a Marx Brothers romp but not nearly as intentionally funny. The whole thing is contrived, there's a lot of talk, talk, talk, and if there is some underlying message, I missed it. BUT, you have to see it for the camp value......it's really more fun than it should be. Maybe Mr. Hughes meant it that way. On second thought, I guess not.